My attitude towards my own creativity is entwined with my personal history and the cultural scene enveloping the years in which I grew to accept and define myself as a writer and performer—the late 1970s and early ‘80s. This historical moment is written into my psyche the way the words of their crimes are inscribed into the flesh of the prisoners in Kafka’s short story “In the Penal Colony.” It was the ultimate era of conservatism and selfishness on the one—generally accepted and publicized—hand, and then it was—for me and the people with whom I was closest at the time—through punk rock, attending university, and the San Francisco music and art scene, the most necessarily renegade and resistant of eras. The latter half of the 1980s and the ‘90s saw the attitudes of these two disparate cultures merge somewhat into a new “independent” movement—especially in music—that can either be interpreted as the co-option of literature, art, and music by low and middle-level capitalism, or as the great opening of the way for the independent artist towards some kind of interaction with an amorphous concept of “the mainstream.” Pros and cons—all possible puns intended. Depending upon one’s opinion regarding the artistic artifact’s interaction with a capitalist economy—either as an integrated commodity or as an object/act of revolutionary resistance—you will see my reluctance to “walk the walk” through the traditional portals of professional writing as either a social dysfunction or a heroic gesture. That’s up to you. Fact is, because of who I am and the way the world was when I first decided to be a writer, I cannot help but bray at the so-called gatekeepers who guard the channels between artists and potential audiences—in my particular case, literary agents and editors. I see my inability to conform my work and my self-presentation to the literary establishment as both a limitation and a freedom, simply what I can and cannot do with my creativity and the works that I create. My background, therefore, explains why I have chosen self-publishing and performance as my primary media: I simply could not function, creatively, within the parameters of an established capitalist paradigm for reaching a mass audience, one that is constructed to support a series of parasites (agents, publishing houses, editors) in a symbiotic relationship with the artist who reap greater—or at least more secure—benefits from the work than the author/artist does. Also intertwined with the act of writing, for me, is the performance of texts. My first hands-on experience with putting words down on paper came in high school, when I began writing song lyrics. I had already been playing drums in a couple of cover bands, when a friend and former band mate, Robert English, approached me during a hiatus between rock ‘n’ roll acts, to join a playful trio with he and Danny Pearson inspired by the experimental, punk, and new wave acts gaining momentum in about 1980. We were called The Snobs and, as the whole thing developed, each of us ended up writing and singing our own numbers, switching instruments to create a tri-partite show/showcase with utter abandon and disdain for any type of commercial conformity. The joy and freedom of doing so has never left me. Later, after the pre-planned dissolution of The Snobs, I found myself continuing to write song lyrics, ever more ambitiously, until I had written a 30 minute-long science-fiction New Wave rock opera. Robert was by then tinkering with 4-track recording and we decided to collaborate on recording the opera and, as we enlisted a couple of friends to help, the band Nominal State was born. We played, performed, and recorded together for about 4 years. The experience I gained having a venue readymade for the scribbling that I was doing—writing songs and performing them in collaboration with the band—melded with the concurrent experience of studying Creative Writing at San Francisco State University, moving from the suburbs to the city, and mixing with the post-punk Bohemian crowd there. The prose work that I produced in this period (1982-6) became a book, Poison and Antidote: nine interlocking short stories inspired formally by James Joyce’s Dubliners, thematically by Henri Mergere’s Scenes from Bohemian Life, and substantially, by my own experiences in nightclubs, art openings, parties, pubs, and squats with the writers, musicians, artists and druggies of the S.F. art and music scene of the period. I’ve just finalized the manuscript and am self-publishing this collection later on this spring—keep an eye out for it. The photograph and cover design of Sojourner lead me into a new collaboration that I wanted to feature here—to give you creative readers something to read as well as a beautiful image to look at. The images are photographs taken by my partner, Debra A. Zeller, who is primarily a wedding, family, and portrait photographer. 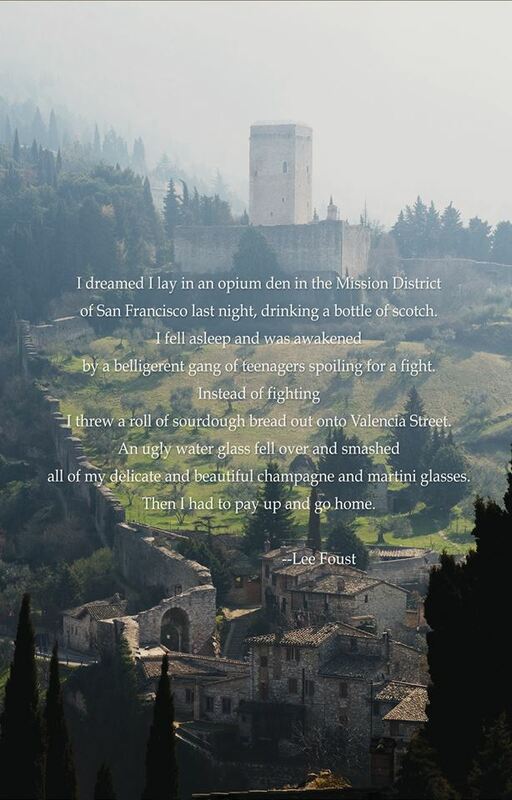 We divide our time between my digs in Florence and hers in San Francisco and, through travelling and experiencing different landscapes together, we have begun a kind of conversation between our two approaches to the mystery of place, the verbal and the visual. 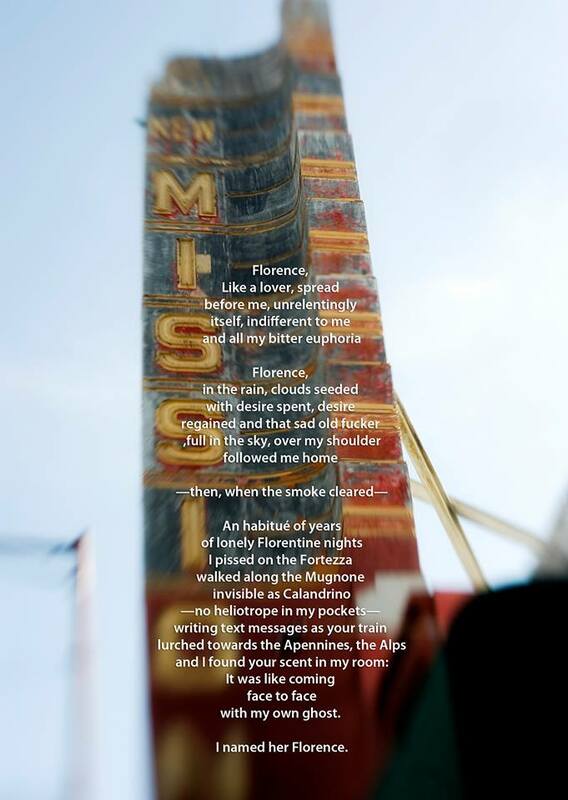 The first two works below are texts of mine about Florence and San Francisco and they are blended with Debra’s images of the opposite places. 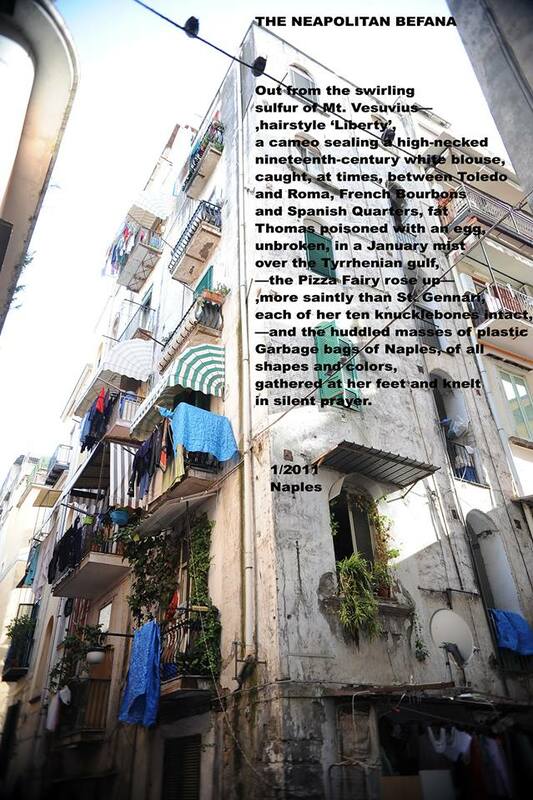 There’s a poem and an image of Naples, which we visited together in 2011. 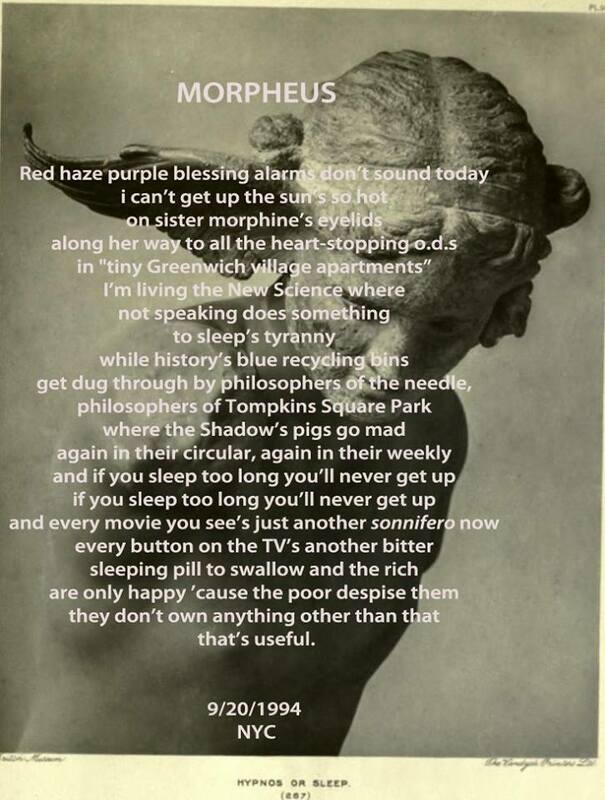 I’ve also added a poem dedicated to Morpheus, the Greek god of sleep, blended with the image on an old postcard of a statue of the same deity from the British Museum I believe. All of these texts are included in Sojourner. Reblogged this on Lee Foust.